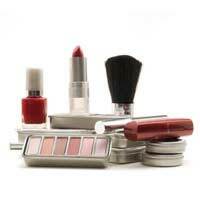 Although items like clothing and shoes are frequently counterfeited, many would doubt that people would go to the trouble of faking make up. But they do. The cosmetics industry generates several billion pounds a year, including skincare and grooming products, where the male market continually grows. With that kind of money to be made, it's no wonder there's a big trade in fakes, with leading brands being ripped off daily, to the point where L'Oreal filed suit against Internet auction site eBay for allowing so many counterfeit sales. A lot of the sales do take place through auction sites, and there's the big problem. Without the item in front of you it's often hard to check its authenticity - and these days the fakers do an excellent job; in some cases you need to be an expert to tell the difference, especially as companies produce so many different lines and colours. It's always advisable to check feedback ratings before buying anything, and where you have doubts, contact the seller, although that doesn't guarantee an honest reply. Before you consider putting anything you're not sure about on your skin, you should understand that you have no idea what's in those lotions and potions. The fakes are untested, and the ingredients could easily be harmful. It's food for thought. Know the products before you shop. Check them out in a reputable store, look closely at names and packaging, and you'll be better informed before you begin. With so many brands on the market, it's impossible to cover everything, and spotting the fakes isn't always easy, but there are pointers to a couple of the popular brands. The first thing to know is that Chanel cosmetics invariably come only in black cases, as does their make up, and the logo is always the simple but elegant Chanel double C. Be wise to the products Chanel really does make, which doesn't include Longitude mascara, for instance, although some auction site sellers have it in stock, making it an obvious fake, as are the Wondercurl, the Transparent Whitening Foundation and the 180 Colour Palette, so steer clear of them. Elsewhere, the fakers often don't get the packaging right, or add a logo where none should really be. Chanel does have a cheaper sister line, Bourjois, but inevitably, there are fakes in that, too. With MAC eyeshadows and pigments, real items have the barcode as a sticker on the box, as well as having the colour name and finish on a sticker on the top of the box. If the eyeshadow contains an applicator and mirror (they'll be in a compartment at the bottom of the pot) then they're fake - genuine items don't have these. As a rule, MAC cosmetic boxes will have a matte, rather than a shiny finish, and though the box might contain language in English and French, where there's writing on the item itself, it will be in English. With the exception of the mascara tube, where it appears on the left, the MAC logo will always be in the centre. Sizes on genuine items will be given in grams and ounces - fakes tend to be in millilitres.